My enthusiasm for the natural world wanes when it comes to things such as earthquakes, floods, tornadoes, wildfires, and mosquitoes. Nevertheless, while our present smoke-filled valleys are distinctly unpleasant, they offer some interesting features. Consider a view of the Sun. Molecules in the atmosphere preferentially scatter bluish light and this produces the blue of skylight. The smoke particles do likewise and, as they add to the scattering, direct sunlight gets distinctly orangish. 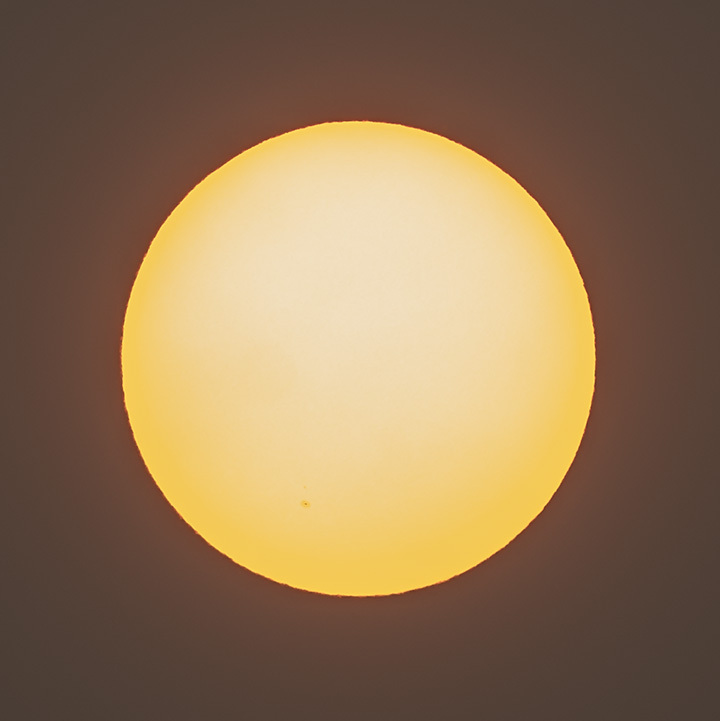 A sunspot can be seen at seven 0’clock. It may be that some of the fuzziness around the edge results from solar prominences. Finally, the limb darkening is asymmetric, with more darkness near the bottom of the image than the top. This is a result of the variation in the path with elevation through the smoke in our own atmosphere. A view of the Sun through our smoke-filled sky reveals interesting features. This entry was posted in scenes, weather. Bookmark the permalink. Outstanding! A whole lesson in a one-page blog! Carlo, I suspect that the use of physics to make sense of the natural world is an acquired taste that not all naturalists share. You may well be right Alistair but I too find it most interesting. Lorna, OK not all, but clearly some. “Count me in”, Alistair. I’m with Carlo and Lorna in responding positively to posts such as this one. Even when I can understand only a fraction of the physics, it’s exciting to be with the life-long learners who seek out sites such as yours. Please keep teaching us, Alistair! The thought that the sun has an ‘atmosphere’ has never occurred to me until now. Of course it must do, as it’s forever giving off gases, right? I must look into this. Thanks much for this fascinating post! Trevor, and the fascinating thing for me is that evidence of the solar atmosphere can be seen by a casual observation from Earth — no big telescopes or satellites required.